Winter preparations mean different things to different people. For example, you might use a couple of shade tarps around your home during the summer. What do you do with them during the winter? Do you leave them in place, or do you take them down and store them? This post we will discuss winter preparations related to shade tarps. 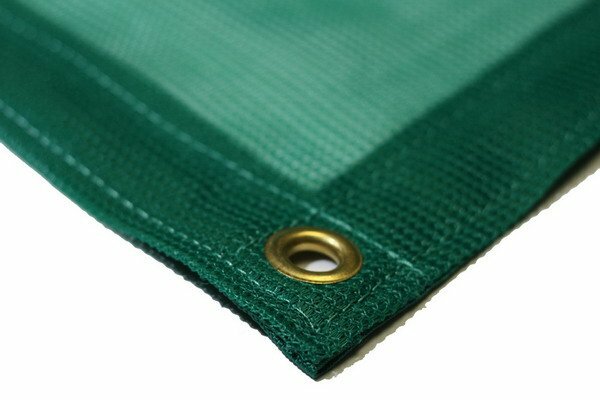 As a reminder, shade tarps are tarps made with mesh material. They allow some sunlight and air to pass through while still blocking just enough to provide a nice respite. People use shade tarps to create outdoor areas for sitting, entertaining, and so forth. Tarps can be any number of colors; black and green are the most common. The first thing to discuss is whether you should leave your shade tarps in place. That depends on where you live and kind of weather you normally see during the winter. Someone living in Central or South Florida probably doesn’t have to take tarps town. The worst Florida residents see in a typical winter is a little bit of rain every few weeks. Those who live in climates with harsher winter weather should by all means take their tarps down. Shade tarps are designed to block the sun; they are not strong enough to withstand snow, ice, and the heaviest winds of winter. Exposing shade tarps to winter weather could lead to their ruin. When it is time to take down and store your shade tarps, a good cleaning is in order. Never store a tarp that has not been cleaned – you never know what kinds of dirt and debris are trapped in between the webbing. As for cleaning, never use harsh chemicals or chlorine-based cleaners. A mild detergent and some warm water will be sufficient. The best way to clean a shade tarp is to hang it across a laundry line. If that’s not possible, laying it flat on the ground works too. Use a soft bristled brush and the detergent solution to gently brush away dirt and debris. Afterward, rinse off the tarp with a hose and let it dry. You might be tempted to put a small shade tarp in the washing machine. Don’t do it. The agitation of the washing machine can damage the material, especially if the tarp wraps around the agitator and gets stuck. It is easy enough to wash a tarp by hand, so just avoid the washing machine altogether. Finally, the same rules that apply to storing other kinds of tarps also apply to shade tarps. First and foremost, never store a shade tarp if it’s still wet from cleaning. Don’t fold it, don’t roll it, don’t do anything until it is completely dry. Otherwise you risk creating an environment that promotes mold growth. Next, fold or roll your shade tarp up in an orderly fashion. Do not just gather it up like a pile of dirty laundry ready to go into the washing machine. A neat, tidy fold will make your tarps easier to store and less prone to rips and tears from having to be forced into an uncooperative storage space. Finally, choose a storage space that is clean, dry, and away from direct heat. Although shade tarps are built to withstand heat and moisture to a certain degree, you’ll extend the life of your tarps by not unnecessarily exposing them to unfavorable conditions. Winter is coming, so take the correct measures to protect your shade tarps. Then they will be ready to go when spring arrives.